I’ve been busy… here’s why! It all started with an idea to surprise her during our Trip of a Lifetime in 2015. After more than 3 years of being together, I thought it was a perfect time to… level up! 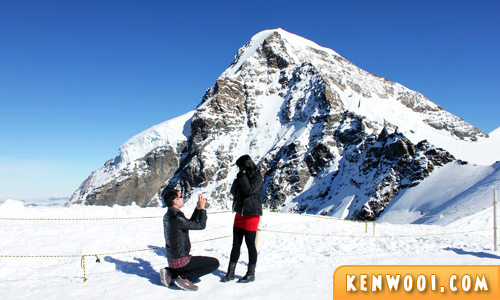 Long story short, I proposed to her at the Top of Europe – Jungfraujoch at the Swiss Alps in October 2015! And that’s how the journey towards our wedding started… about 1.5 years back. There weren’t much progress after the proposal actually. We practically continued on with life after the trip and didn’t discuss much about how our wedding would be like, or when and where it would take place. Yes, there were occasional chats about the wedding. In fact, we thought of having an out-of-the-ordinary-family-only wedding ceremony at a foreign country… like Santorini, Greece. The idea was to only fly immediate family members in and have a really simple yet memorable wedding. It’d cost a bomb, though. However, our parents (mine, especially) weren’t keen on the unorthodox idea. So we resorted to organizing it in Malaysia. The first step for the wedding was to select the date. 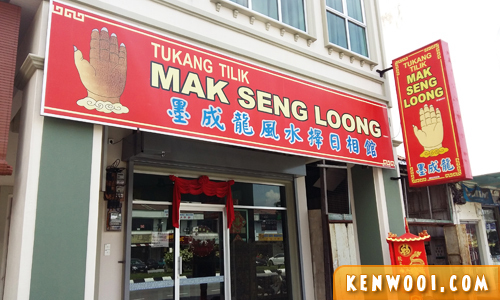 We went back to Ipoh and visited a fengshui master to obtain a prosperous date for the wedding. My dad brought us there. We were given a few dates, and we picked 18 March 2017 for our traditional Chinese wedding. Honestly, I wouldn’t have known how to “pick a date” if it wasn’t by going through this exercise. On top of 18 March, we also chose 17 March 2017 (the day before), as our Garden Wedding ceremony. Hence, we have 2 dates for our wedding! The hashtag theme #LynnOnKen was discussed a few months before the wedding. Call it “social media” pressure, we also fancied the idea of having our own wedding hashtag. The creation of the hashtag wasn’t easy as we wanted it to have a meaning after integrating both our names. 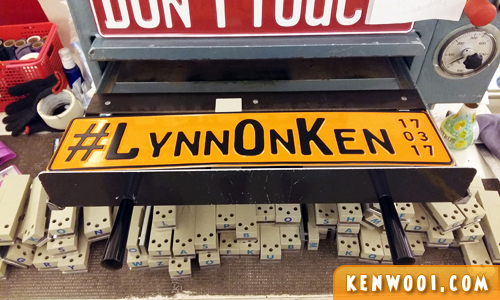 Finally, we decided on #LynnOnKen and it basically means “Lean on Ken”. Most of the discussion took place during our drive to and fro Ipoh. For the record, there were funky ones like #WooingFooever, #JoyFooWooiding, and #KendidShane. Next on the list was the venue. Despite both of us living in KL, we decided to have our wedding in Ipoh, my hometown. 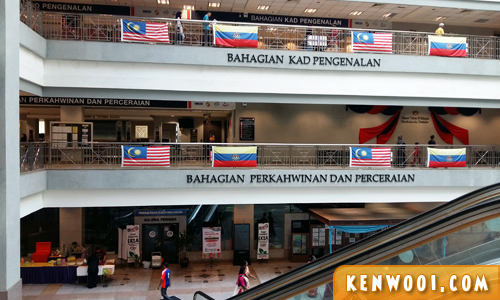 It was the only location as we didn’t intend to plan for another ceremony in KL. Now that we have Ipoh in sight, we scouted for places with a garden for our Garden Wedding. 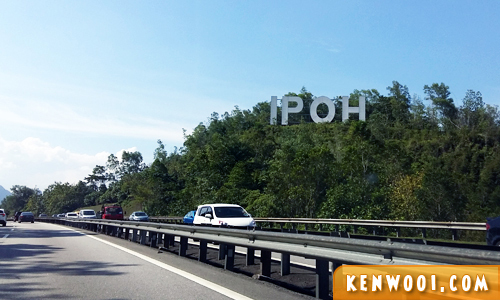 We went to 3 places in Ipoh, namely The Banjaran Hotsprings Retreat, The Haven Resort, and Adonis Bridal. 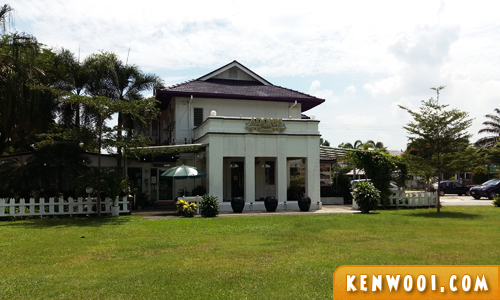 Comprehensive Garden Wedding Package – inclusive of venue, decorations, gowns, food, and many more! Another venue to be decided was for the Wedding Dinner. Well, we didn’t have to crack our heads for this as we knew Pusing Public Seafood Restaurant would be the one and only choice. 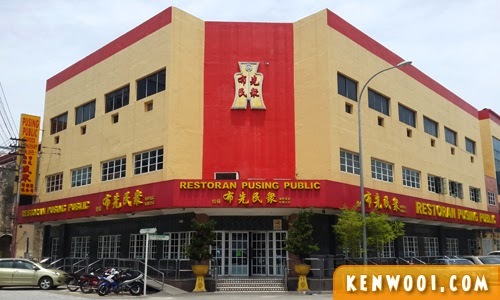 Best Chinese Cuisine in Ipoh – hands down! Dad’s Favourite Chinese Restaurant – ours too! Besides the engagement ring, we took a while to look for our Wedding Band. 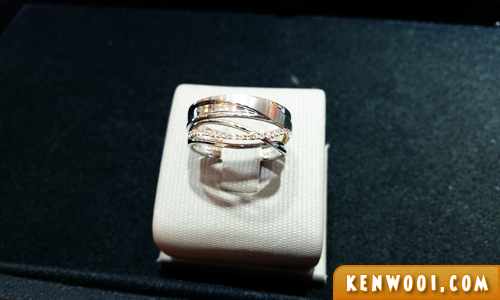 We visited the usual jewellery stores to find our preferred designs, and finally spotted them at My Diamond. As you can see, our wedding bands doesn’t come in a couple design. We were pretty liberal with our choices, so she picked her design while I picked mine. Her wedding band (curvy one) was meant to compliment her engagement ring (which is also curvy). As for mine, I prefer a solid and thick one. 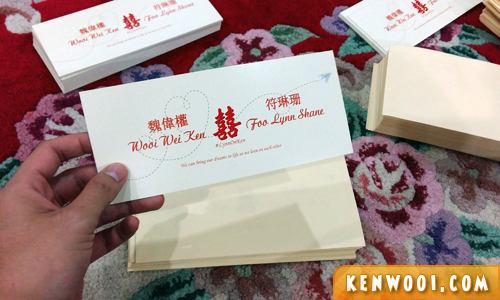 About 3 months before the wedding, we searched online for a wedding card designing and printing service. We stumbled upon Purple Cards, selected a standard design template, proposed a few amendments, and got our wedding cards printed within a month’s time. Since most of our relatives were Chinese literate, we opted for a dual-language English and Chinese card. Also 3 months prior to the wedding, we flew to Phuket to get my wedding suits done. 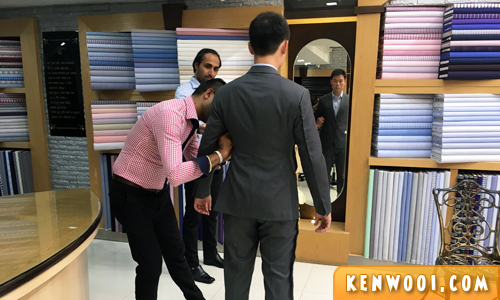 It was my first experience with custom-made suits and the service was excellent. Really enjoyed dealing with the staff there. I got myself measured on the first night upon arrival in Phuket, fitting session the night after, and got the suits delivered to Malaysia approximately 3 weeks later. We also got ourselves a new pair of wedding kicks each… both from Pedro. It was by mere coincidence that we came across these shoes. Our visit to a Pedro outlet was solely to purchase a replacement shoe lace for my Pedro work shoes. Yes, I’ve been wearing Pedro since 2015, and I simply love their sleek design. A common goal by soon-to-be-wedded couples is to undergo a fitness regime to get fitter, skinnier, buffer, or whatnot. Shane and I had the same intention too. 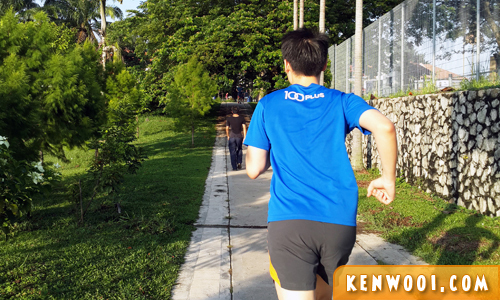 She subscribed for a 1-year gym membership, while I increased the frequency of my running workout. However, you can’t be someone you’re not. Shane didn’t consistently set foot into the gym (like 3 months consecutively!) and yet her gym membership was auto-debited every month… money burnt! As for myself, I tried to run more but was pretty much lazy. We ate and snacked as usual, and although there were the occasional DAMN WE SHOULD SLIM DOWN moments, I guess we realised we just gotta be ourselves. Many people were extremely surprised when we said that we didn’t do any pre-wedding photography. “But… it’s once in a lifetime!”, they exclaimed. 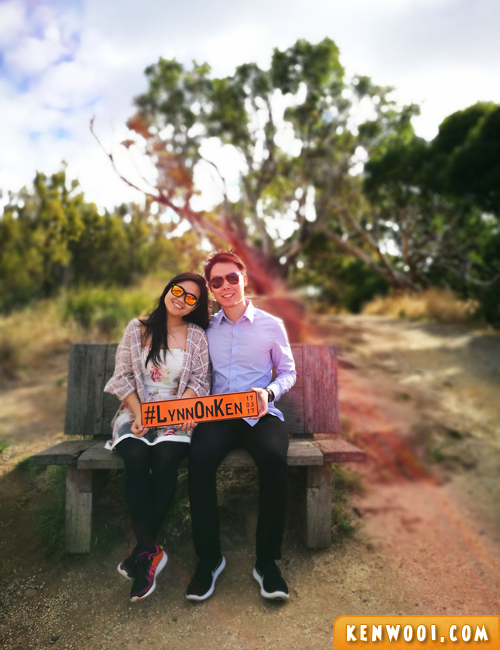 In the end, we attempted our own pre-wedding photography (with a Huawei P9) during our trip to Melbourne, especially during the Great Ocean Road trip in February 2017. With all the photos we have, we made 2 photo books via Photobook, an online photo book editor and printer. 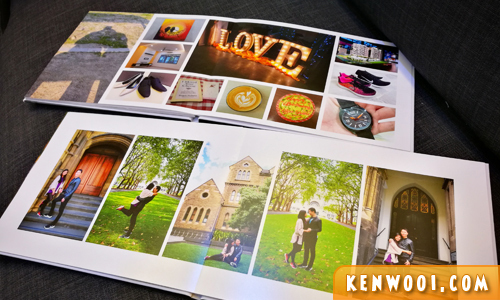 The photo books aren’t the usual wedding album with glamorous shots taken by professionals. In fact, they contain our personal photos taken over the years which brings back interesting memories of us in the past. On the 17 February 2017 (a month before our Wedding Ceremony), we got ourselves legally married at JPN Putrajaya. 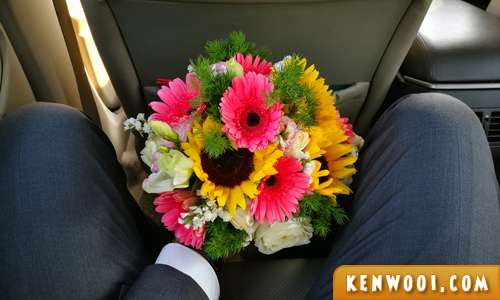 This occasion is commonly known as the Registration of Marriage, or ROM. We did the usual marriage application, waited for 2 weeks (if anyone objected, but no one did… heh! ), and selected our preferred date. The ROM session took about 15 minutes, witnessed by close family members and friends. Here’s us after our ROM – legally married by law! 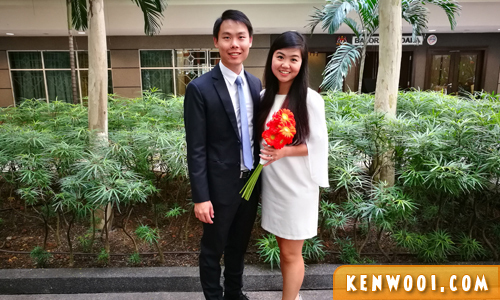 Fast forward exactly 1 month later, our Wedding Ceremony was held on the 17 March 2017. 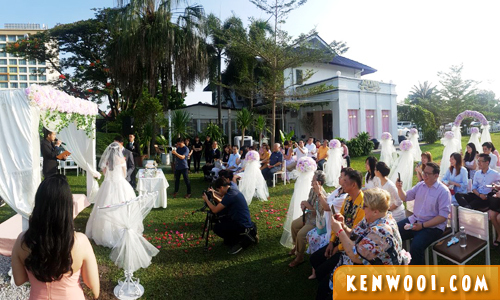 We hosted the bride’s family members at Indulgence Restaurant & Living, a beautiful mansion in Ipoh with a restaurant on the Ground Floor and hotel rooms upstairs. 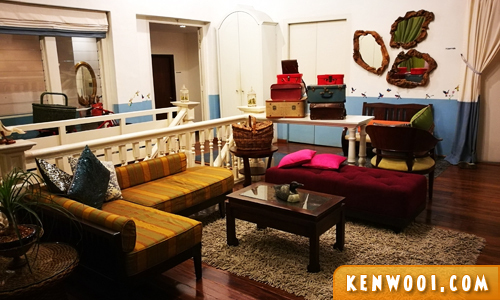 We booked all 7 rooms for the weekend and our guests absolutely loved the place. Indulgence also served as the reception for the bride during the bride pick-up and bride’s side tea ceremony sessions. Here’s the day we’ve been anticipating… our Garden Wedding at Adonis Bridal! Our wedding theme was pastel colours, mainly revolving around peach, purple and beige. There were close to 40 guests for the occasion. We were very thankful for the fantastic weather! It was actually sunny and hot, but it’s way better than having gloomy skies and rain! There were both sweat and tears throughout the occasion, but it was a beautiful moment for us and our family members and friends. On the next day, we did the bride pick-up and the bride’s side tea ceremony at Indulgence. We then went back to my Ipoh house for the groom’s side tea ceremony. The whole experience was very intriguing as I witnessed the Chinese wedding’s traditional flow. That includes the dowry delivery and addressing of relatives in the actual “relationship” terms during the tea ceremony. Just to share, we actually didn’t do a full-fledged traditional Chinese wedding with all its proceedings. Only some simple ones were followed, while the rest were left out as we find it hard to relate to the true purpose and meaning. Really grateful that our parents are open to that! Fast forward to the night itself, the final part of our wedding… the dinner! 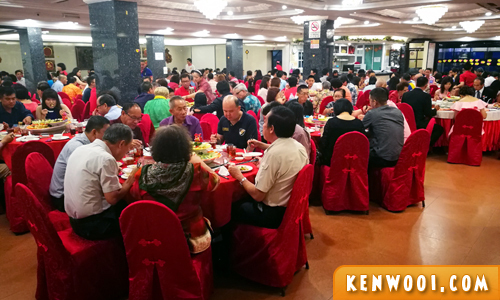 The wedding dinner was held at Pusing Public Seafood Restaurant and there we 39 tables in total occupying the entire Ground Floor of the restaurant. It was basically a restaurant… so unlike organizing it in a hotel ballroom, there wasn’t a red carpet walkway, huge stage, or even performances. We wanted the dinner to be a time where family members and friends come together to celebrate our milestone. We made it simple, yet meaningful, for all. For as long as our guests are happy, we’re happy as well. So that wraps up the journey with #LynnOnKen! Not forgetting our beloved parents (and parents in law) who have raised us unconditionally, taught us to love, and supported us throughout our endeavours. Awesome. It’s a beautiful wedding.